A Direct to Consumer Activation or DCA is one of the most effective ways for a company or organization to engage the public at an event or function. We have specialized in creating customized and pre-formatted activations for some of the worlds largest companies. At UnitedHealth Group we created a catalog of activations based on technology and information used every day by our staff. Each activation is individually tailored to the clients specific event or function. Choose from pre-designed activations or have us design one specifically for you. Contact us today for more information on pricing and logistics. Ride like a pro cyclist for 30 seconds to see how fast you can go. 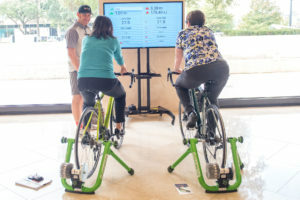 Using our Kinetic Fluid smart trainer technology participants spend 30 seconds riding as hard as they can to see what kind of numbers they can produce. Data fields include; speed, distance, watts and calories burned. Perfect for health fairs. Tap into the iconic NFL Combine experience by letting your target audience see how they measure up against your team. This event uses the 40 yard dash, 3 cone drill, vertical jump and standing long jump. It has been proven to be one of the best attractions at NFL events and is a great way to tie in corporate branding to the fun fan experience. A simple way to engage conference attendees and help them make the healthy choices. Using a badge style game format, attendees earn badges for completing normal healthy choices and activities. A random drawing at the end rewards participants with fitness related prizes. Uses common phone application technology normally already in existence with most events. Allow event attendees to benefit from the knowledge of our coaches, while interacting with your brand. We work with vendors to bring in a portable pool and with the use of our state-of-the-art underwater camera system and video analysis software we supply swim technique tips while attendees interact with your brand. A simple nutrition demonstration (with a twist) that will help you make better choices. Everyday life sometimes forces us to eat on the go. Learn how to make better choices at less than optimal locations. Information on sodium and sugar levels are displayed on the table for an even greater impact. Perfect for baseball enthusiasts of all ages. Learn how to hit the ball longer. Using our video analysis software we have participants swing at a batting aid while recording their effort. We play it back in slow motion and give suggestions on how to be more powerful and efficient.